A drug trafficking action drama set on the US/ Mexico border, Sicario offers plenty of style and occasional tension, but undermines itself by frustratingly leaving blank key plot and character elements. 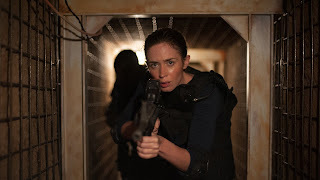 In Chandler, Arizona, FBI agents Kate Mercer (Emily Blunt) and Reggie Wayne (Daniel Kaluuya) lead an FBI raid on a house owned by drug lord Manuel Díaz. The grisly discovery of dozens of dead bodies hidden in the walls of the house, followed by a large explosion, announce a new phase of brutality in the Mexican drug trade. Kate is nominated by her boss Dave Jennings (Victor Garber) to join the special team of CIA agent Matt Graver (Josh Brolin), working to identify and stop Diaz's boss. Kate soon meets the mysterious Alejandro (Benicio del Toro), who appears to have a dark past in the drug trade, and accompanies Matt every step of the way. With Reggie her only trustworthy ally, Kate also realizes that her involvement is intended to provide cover to Matt's barely-legal CIA operations. She joins the CIA team on a tense raid into Mexico to apprehend one of Diaz's associates, which kicks-off a chain reaction of events intended to flush out the head of the drug cartel. With the violence escalating on both sides of the border, Kate begins to question whether the solutions offered by Matt and Alejandro are any better than the problems they are trying to solve. Directed by Denis Villeneuve, Sicario (hitman in Spanish) dives into the deep end of the underworld drug war raging along the southern United States border. The film is frequently visually stunning and bursting with muscular action, Villeneuve deploying fluid cameras to capture shady government operatives flaunting the rules of law in two countries, in response to drug lords elevating the levels of brutality and violence to unimaginable decibels of horror. The story is revealed through Kate's eyes, and her by-the-book FBI training is torn asunder by the CIA running roughshod over anything that resembles due process. Matt, and more mysteriously Alejandro, make up their own rules, provided with cover by faraway faceless politicians eager to gain some measure of control and not worried anymore about the niceties of national laws and jurisdictional boundaries. The film is filled with dead bodies, heavily armed and thick necked Delta Force types who shoot first and never get around to asking questions, and plenty of armoured black SUVs and nifty helicopters lending heft to the battle against drug traffickers. Kate may be worried about the unauthorized imprisonment, torture, shoot-outs and killings, but rarely has a deadly conflict looked like so much fun. 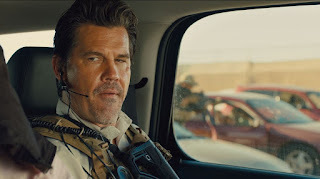 But beyond the adrenaline-packed scenes of burly men pointing big guns at each other, Sicario seems to want to say a lot more. The blurry lines of the CIA's authority to carry out operations on US soil are hinted at, and the briefest outline of a plan to ease the drug violence by controlling but not stopping the industry is sketched in. But the Taylor Sheridan script takes only tentative steps in these directions, and then backs away. Instead of delving, justifying or debating the issues, the film loses energy with plenty of repetitive scenes featuring a frustrated Kate asking the same questions and getting the same non-answers from Matt. The character development is also lacking. Kate, Matt and Alejandro are three clearly fascinating people who are very much worth knowing. But the film ends and it is disheartening how little is known about them, beyond the here and now. The missing depth adds to a cold emotional core, and beyond Kate's abject horror at the extrajudicial methods callously used by men like Matt and Alejandro, there is little resonance to all the action. Emily Blunt, Josh Brolin and Benicio del Toro are never less than committed, without being able to delve into any personal contexts. 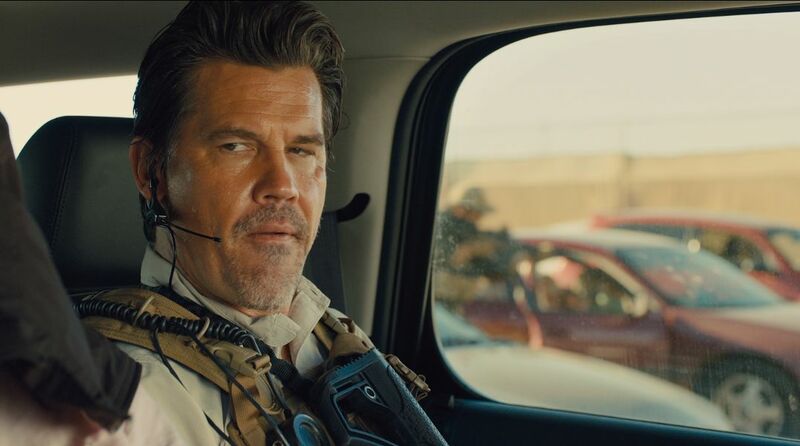 Sicario hints at having important things to say past all the blazing guns and impressive hardware, but actually offers disappointingly little in the way of enduring substance.